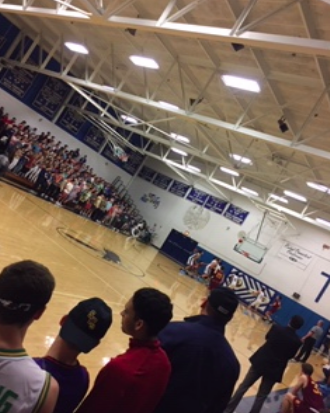 Every year, students of South Windsor High School get excited for the biggest basketball game of the year, when the boys play against East Catholic. The crowds from both schools fill the gymnasium. This Friday, the boys played at East Catholic High School. Even though this was an away game students want to travel with the South Windsor in order to watch the intense game. On Friday night, the starting 5 included Shai Harrison, Trevor Anthony, Justice Ellison, John Relaford and Zach Donahue. Senior Marcus Rodriguez looked forward to the game before it even began: ¨It’s going to be a tough but exciting game. Having the gym filled with South Windsor students will help excite the team and [make them] want to win even more.” This year East Catholic’s team is very tough. The SWHS team went into the game with hopes to play hard and keep up with East. As Friday came along, the East Catholic gym filled up by 6:45pm. South Windsors spirit was sports jerseys; many students decided to wear some of South Windsor player’s jerseys. Senior Alyssa Millerd wore Zach Donohue’s jersey showing her support to the team. As the game began, South Windsor started with a 3-0 lead as Justice Ellison scored the first shot. Throughout the first quarter, East Catholic had a strong defense leading them 56-23. The rest of the game South Windsor continued working hard but could not close the gap in the score. At the end of the game, East Catholic won the game with a score of 100-43. South Windsor plans on taking East Catholic again at home later in season, best of luck to the boys!